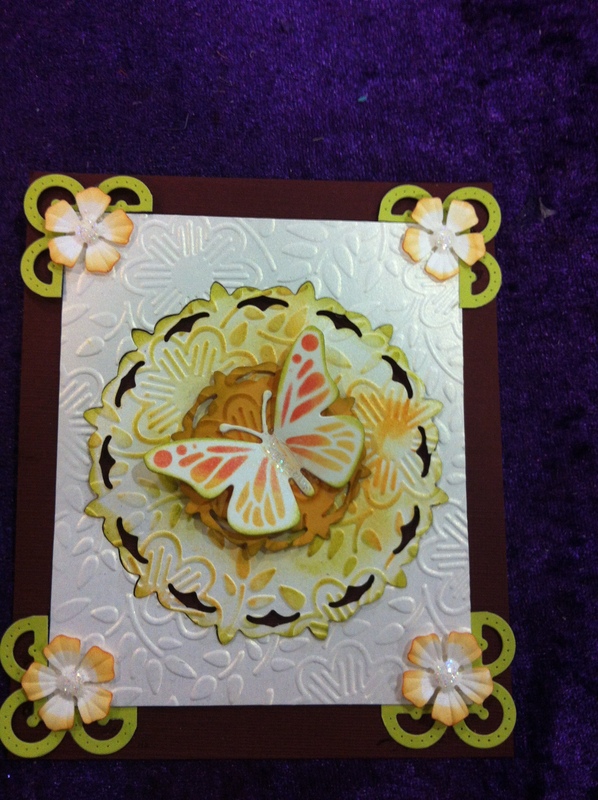 I made this card whilst demonstrating at the weekend. I used a couple of Marianne dies, a Kreaxions die and an M-Bossabilities folder. I coloured it with distress inks and finished it off with Stickles glitter glue. I think the colours work really well together and had fun pinching and folding the papers to give it dimension. Hope you like it, let me know. A days teaching today and I was in a creative mood too. Whilst tidying my desk I discovered a stack of half completed ATC’s and had great fun embellishing them. The first one (top left) was created with Touch textile paint by Pebeo and abandoned because I didn’t like the colours. I re-coloured the background with Pro Markers and then I added extra Touch Paint around the edges. The second(top right) was created with Distress inks direct to paper. 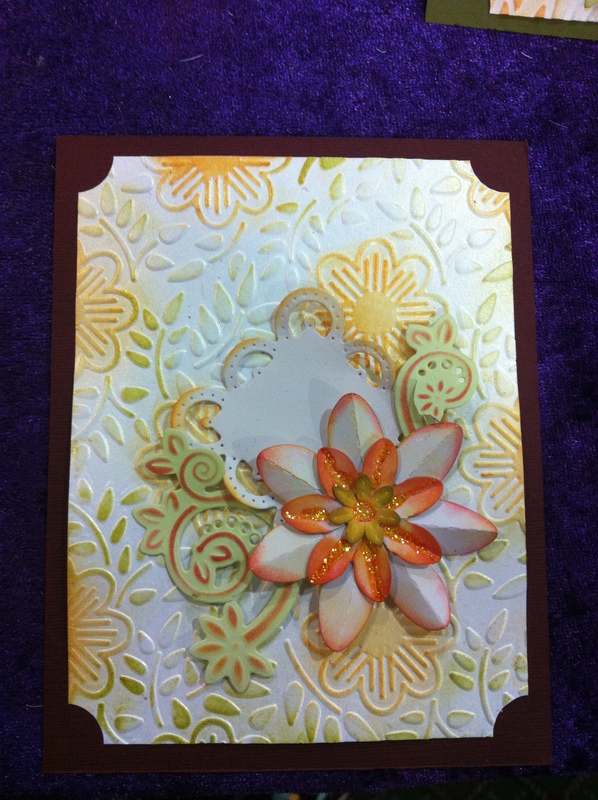 I then drew on top with a Metallic brush pen, created a flower with a stencil and finished with a pearl in the centre. 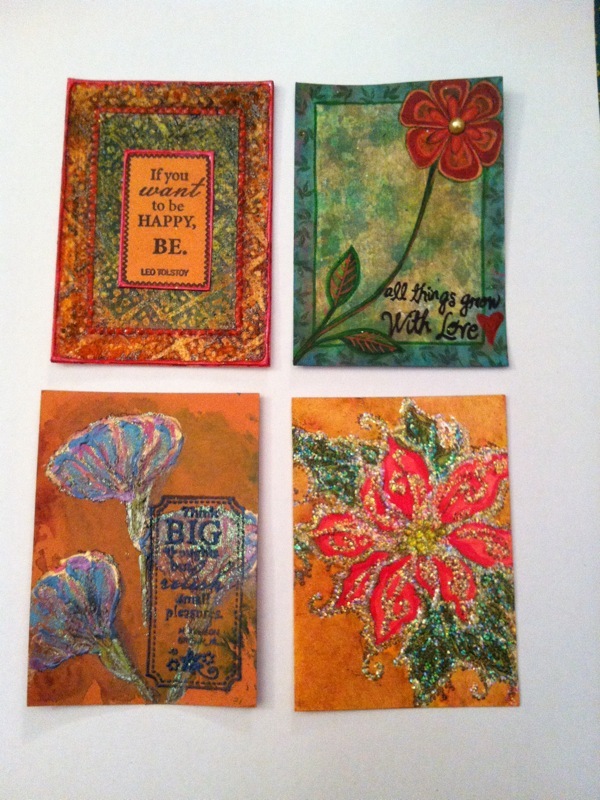 The third (bottom left) was originally stamped with Touch paint and sprinkled with ultra fine glitter. I resurrected it with Touch in Pearl colours which I applied with the tube and a paint brush. Last but not least was a gold heat embossed image of a poinsettia which I coloured in with Pro Markers and then adorned with Stickles glitter glue. I didn’t like it so I sanded it down when dry and removed some of the glitter. I added word stamps where appropriate and used Touch black Metal paint with a fine glitter glue nib attached to enhance the wording.